Mucoepidermoid carcinoma affects children and adults and is the most common salivary gland malignancy. Women are involved slightly more than men. 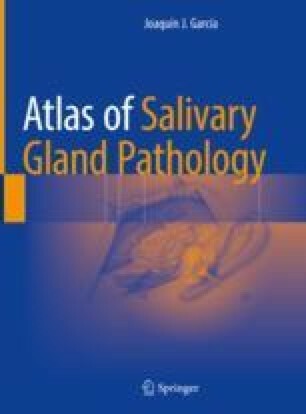 The majority of cases involve major salivary glands, presenting as single or multiple masses. Most cases of mucoepidermoid cell carcinoma behave as low- to intermediate-grade malignancies. Mucoepidermoid carcinoma may be well-circumscribed or infiltrative, comprised of multiple cell types (mucous, epidermoid, and intermediate), and exhibit a variety of architectural patterns (solid, cystic, oncocytic, and sclerosing) (Figs. 17.1, 17.2, 17.3, 17.4, 17.5, 17.6, 17.7, 17.8, 17.9, 17.10, 17.11, 17.12, 17.13, 17.14, 17.15, 17.16, 17.17, 17.18, 17.19, 17.20, 17.21, 17.22, 17.23, 17.24, 17.25, 17.26, 17.27, 17.28, 17.29, 17.30, 17.31, 17.32, 17.33, 17.34, 17.35, 17.36, 17.37, 17.38, 17.39 and 17.40).